The small town of Shepshed, situated near to Loughborough in the north of Leicestershire, has had football teams associated with it since 1879, when the town was known as Sheepshed. Whilst many of these teams achieved local recognition over the years it was with the formation of the Charterhouse club in the mid 1970’s, that the name of Shepshed became known nationally. Between 1978 and 1984 the club rose from county league to the Southern Premier League, winning 7 consecutive Championships/Promotions. During this period they also reached the Semi final of the FA Vase, and the 1st Round Proper of the FA Cup, while providing a staging post in the managerial career of one Martin O'Neill. Unfortunately the Charterhouse club, then known by it’s original name of Shepshed Albion, closed down in 1994. The current Dynamo club was formed in the summer of that year in an attempt to resurrect the town's former glories on the football field. After featuring Shepshed last time out, we cross the border from Leicestershire up into Nottinghamshire, arriving at the Cannon Park home of Retford United just in time to commemorate their winning debut in the FA Vase. Formed in 1987, the Badgers faced Oldham Town of the North Western Counties League at home and ran out 3-0 winners to claim a place in the Second Round. 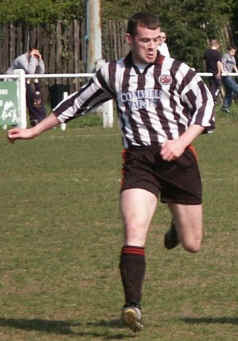 That win was partly to due a pair of goals from prolific striker Vil Powell (pictured) once of Unibond side North Ferriby and the subject of interest from a number of Nationwide league clubs. The visitors from Lancashire no doubt went home deflated, but not quite in the manner that marked their exit from last season's FA Cup, courtesy of a 17-1 defeat at the hands of Stocksbridge Park Steels. 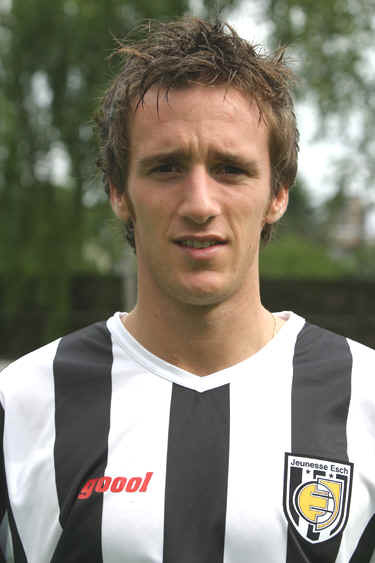 Looking almost like the Luxembourg equivalent of Lee Bowyer, this is Sacha Rohmann of AS Jeunesse Esch. Frequent Luxembourg championship wins have ensured regular participation in European competition since 1958, with a European Cup tie against Liverpool in season 73/74 which saw a 1-1 in Luxembourg and a 2-0 win for the reds at Anfield. More recently Celtic inflicted an 11-0 aggregate UEFA Cup defeat on them in the UEFA Cup. Jeunesse Esch are currently second in their domestic league to Spora, but while the lads in black and white normally pull just over 1,000 fans for home games, Spora have been down as low as 141 recently. To the Cheadle and District football league we turn our attention, with the boys of Nantwich taking centre stage in the TAPIBAW corner. And we join the U13 side at an appropriate juncture, with this weekend seeing them draw with their Newcastle (Staffordshire) counterparts in the League Cup. PS - I don't know about you, but this Nantwich Town badge does look oddly familiar. Now Stop Me If You Think You've Heard This One Before, but Is It Really So Strange to find a TAPIBAW in the heartland of Manchester? Despite the goalkeeper apparently flaunting the rules by refusing to put his Hand in Glove, the Salford Lads Club side qualified for the Manchester Federation finals back in May. Unfortunately, they've never updated their website since so we still don't know whether Some Goals Are Bigger than Others and we're afraid to Ask. We're unable to confirm whether any members of the side are indeed Rusholme Ruffians or couldn't field a sub as he was Still Ill.....but after all, What Difference Does it Make? 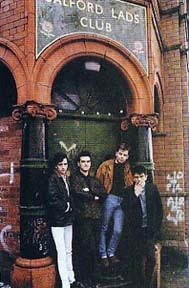 In the very-likely event that the above gibberish is of no relevance to you, we'll better explain ourselves - Salford Lads Club as you can see from this photo was used as a backdrop to a photo that appeared on the sleeve of The Smiths vinyl masterpiece "The Queen is Dead."